We begin the design process by working together as a team to determine your needs. This is where the true collaborative innovation begins. Sometimes our customization means redesigning the motor with additions; other times only a slight adjustment is needed. The benefits of customization are inarguable. Working together, we push the industry boundaries to find a solution - sometimes the solution results in a simplification of design and even cost reduction. Collaboration with Portescap means tapping into our engineers' knowledge base. These experts have vast experience and can help to guide you in the right direction. Even if you’re unsure of where to begin – we can help. Our customized motors are always designed for manufacturability which helps save time, energy, and cost during production. Remember - the earlier you bring our team into the process, the better the results. 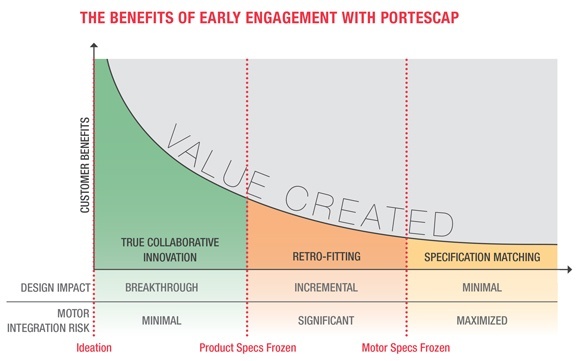 Portescap customers walk away with customized motors that have longer life, higher power, and can simplify the assembly process. Contact us so we can do the same for you.